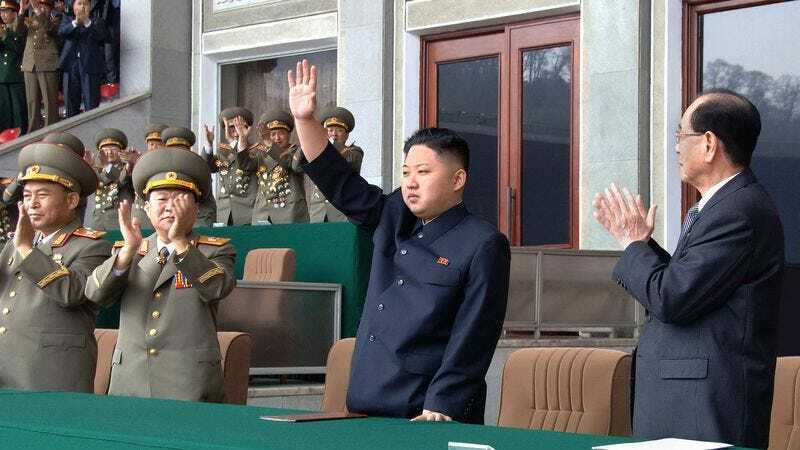 Thousands cheer Dear Leader Kim Jong-un’s triumph of being the first man to walk on the moon. PYONGYANG—Jubilation sounded far and wide in the North Korean capital today as upwards of 100,000 cheering citizens proudly thronged Kim Il-sung Square to celebrate the historic news that Dear Leader Kim Jong-un had become the first man to walk on the moon, ecstatic North Korean sources reported. North Korean officials confirmed to the cheering multitudes that not only had the country soundly trumped and “obliterated the memory” of South Korea’s recent successful launch of a civilian rocket, but that the unprecedented moon-walking achievement was performed by none other than the supreme leader Kim Jong-un himself in yet another display of his substantial cleverness and strength. Sources reported a hush falling over the crowd as officials then recounted North Korea’s impressive aeronautic history, contextualizing this latest achievement in a string of uninterrupted triumphs, dating from 1954’s successful overthrow of imperialist South Koreans to the founding of North Korea’s vaunted space program earlier this decade, which government sources called the most advanced in history. The rapt crowd then erupted into pandemonium as celebratory rice rations, vitamin packs, and canned water were distributed. Numerous North Korean sources also wondered aloud whether the rumors were true that Pyongyang’s vast network of computerized online data—the first of its kind in the world—would soon reach the outer provinces.